Retreat to your own private island in Belize. As you arrive, naturally shed away a life behind you to reveal a new world within you waiting to be explored just below the surface. Dive into the crystal clear waters to swim with the life under the sea waiting for you to come and play. Joy is waiting for you here…come discover what is new, what is possible. nOMad is heading back to Belize. 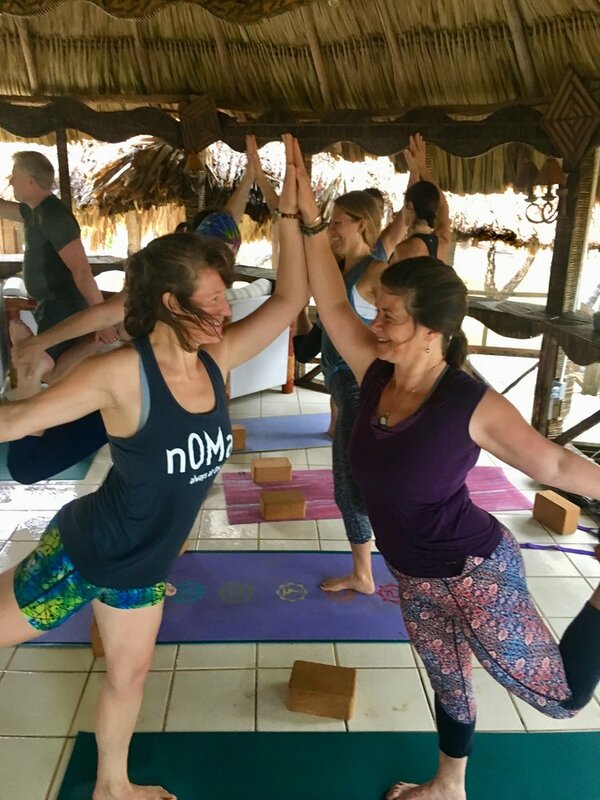 Join the nOMad tribe and explore the beauty of the Belize Barrier Reef while diving deep into our own inner landscape through the practices of yoga lead by Phoebe Miller and Becca Roberts. Our own private island. Enjoy lots of private time on our nOMad tribe’s own little mile long Caye rooted by mangroves. Each day relax into the seemingly endless time and space while syncing our own inner rhythms with the slower pace of life and the sounds of nature around you. Arrive to BZE no later than 3:45pm. Phoebe was inspired to begin this nOMadic journey in 2013 after a year full of obstacles. I decided to live out a dream of marrying two of my passions, traveling and teaching. I have always been a firm believer in finding opportunity for growth from all of life’s gifts, so I packed up my life and went for it. I am grateful to be building a tribe of nOMads from the ground up now with a thriving Hudson Valley yoga community, a growing global online community, offering various teacher training programs, and bringing you all together on retreats around the world. Becca is the owner and founder of Namastesis LLC. I consider myself "Always a student of yoga. and it's philosophy. "My passion is for the care and understanding of my students on a physical and mental level is one of a kind. I tailor each private and group practice to meet the needs of each individual student.When you come to my class, you can rest assured that you will feel comfortable, safe and at home within your practice.